Nor' West Company is owned by Thom "Swanny" Swan (in red clothing above), a muzzleloader shooter since 1976 and an avid living history enthusiast. Swanny is a frequent participant at rendezvous and historical treks in Alaska and the Lower-48. 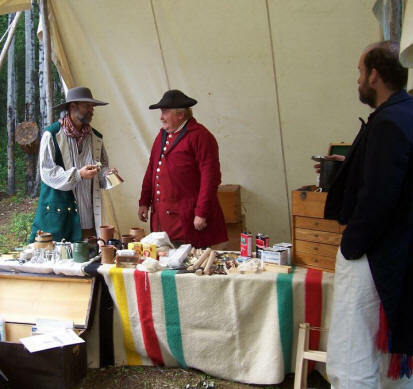 In his own living history activities, Swanny portrays an eighteenth century fur-trader and in this role brings his products to a variety of living history events around Alaska, where he displays them in a historically authentic fashion. Our event schedule is generally listed in the Living History Activities in Alaska page of our web. Swanny is a past national president of the Coalition of Historical Trekkers, a member of the Alaska State Muzzleloader Association, the Alaska Trappers Association and Midnight Sun Muzzeloaders and is a frequent contributor to living history and muzzleloader shooting magazines and other publications.